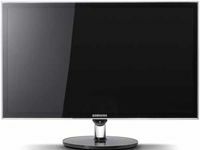 The Samsung PX2370 23" is a wide-screen LCD-LED backlit monitor. QUALITY AND EFFECTIVENESS: The Samsung SyncMaster PX2370 is a compelling monitor in a market stocked with options. The display offers full 1,080p HD resolution at 1,920 x 1,080, and the clarity and sharpness of the images displayed are outstanding. The matte screen gives viewers an excellent anti-glare viewing experience at several viewing angles, though the loss of the reflective glossy finish does mean less of the color saturation that glossy screens excel at. High-definition content and high-resolution photos on the display were stunning. The unit has a 2 ms response time, and this reduces essentially all the motion blur typically associated with LCD displays. The PX2370 is a backlit, LCD-LED monitor that also earns an Energy Star rating for its efficient energy consumption, which many users will greatly appreciate. The display has the MagicLux feature, which uses an ambient-light sensor to automatically adjust the screen brightness to match the environment in which the display is placed. EASE OF USE: The PX2370 comes standard with a variety of display connections, including the standard DVI, HDMI, and analog RGB, and can be set up in moments. The ultraslim design results in an incredibly lightweight unit that is easy to move as desired. All controls are neatly concealed behind the bezel for aesthetics, but this does present a challenge when you are trying to adjust the monitor without turning the unit around. CREATIVE USE OF TECHNOLOGY: The PX2370 has several power-saving features, including the LED display, MagicLux brightness controls, power-consumption percentage controls, and construction that is halogen and lead free. The unit also has contrast ratios of up to 5M:1 and a fast response time of 2 ms. Samsung also includes its Magic Return technology, which allows the content displayed on the monitor in dual-screen mode to transfer back to the primary display before powering down. SUITABILITY FOR USE IN A SCHOOL ENVIRONMENT: Though the PX2370 is an outstanding display, it may be more for special uses and less of a standard device. Its size would prevent it from serving as a standard display in a lab setting and in most classrooms. The absence of a vertically articulating mount would make it somewhat difficult to employ the unit in educational settings where users have to adjust the height of the monitor because of their age or specific viewing needs. The Samsung PX2370 is an outstanding display. The pricing is also a strength. Samsung lists the unit at $465, though at press time this unit could be found at myriad online sites for slightly more than $300. This price is half that of many other displays with similar functionality, performance, and feature sets. If you are looking for a large external monitor or an upgraded primary monitor for a desktop, the PX2370 is an excellent choice. 3 The ecofriendly Energy Star–rated features.